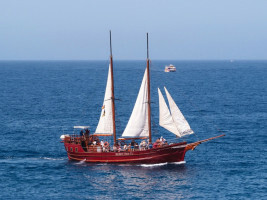 Enjoy the most enjoyable and fun family cruise aboard an authentic Portuguese Goleta of the last century that will revive the emotions of ancient sailing, as well as stories of pirates that once surfed these seas. The boat has 2 decks, 2 services, an open bar and a large central table. 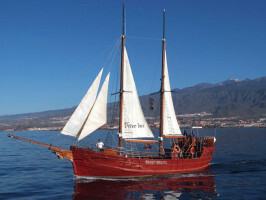 2 hours trip: Safari in search of dolphins and whales and pilots and along the costa adeje coast and Los Cristianos. Includes water and soft drinks. 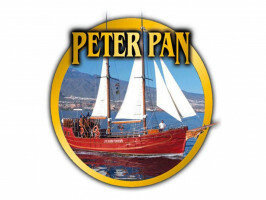 3 hour trip: Suitable for families, with a little animation for children. 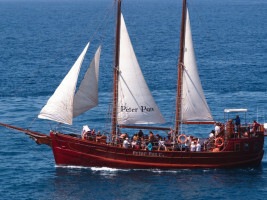 After watching Whales and Dolphins, the boat will later anchor in bay for swimming, lunch. Includes lunch (salad, vegetable rice, chicken, meatballs, bread and fruit). Meeting point: Puerto de los cristianos, muelle de excursiones Zona A. Start time: 10am or 1:30pm aprox. End time: 1:00pm or 3:30pm aprox.